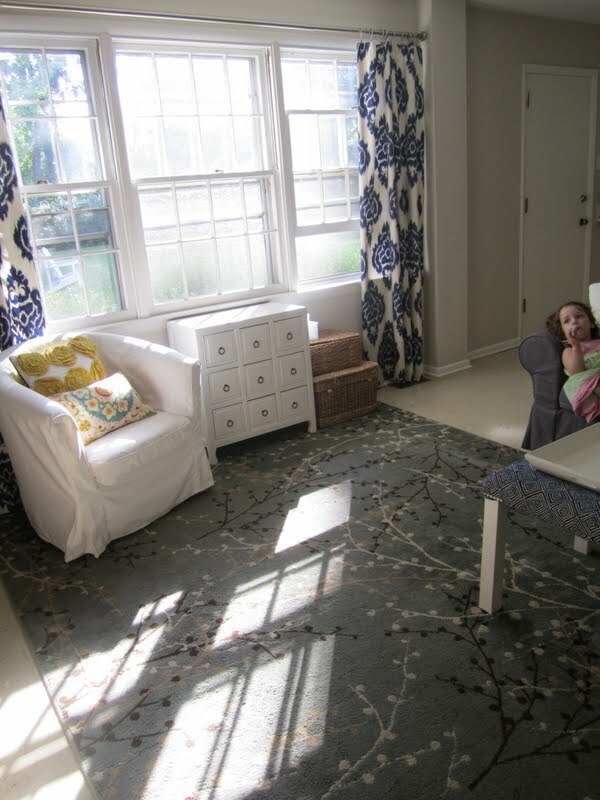 Swoon Style and Home: Finally Getting Off the Merry-Go-Rug in my Den! Now for a trip down memory lane. When we first moved in I needed something to fill the space, so I put our old 5x8 dining room rug in there. The problem: it was too small and too hard, which was not surprising given it was an indoor-outdoor rug. Plus, the color was totally wrong. Then I found what I thought was The Rug for the den: a soft tone-on-tone striped rug from Crate & Barrel, size 6x9. It arrived and it was so super soft and cushy. It was also too small and way too white for this room. 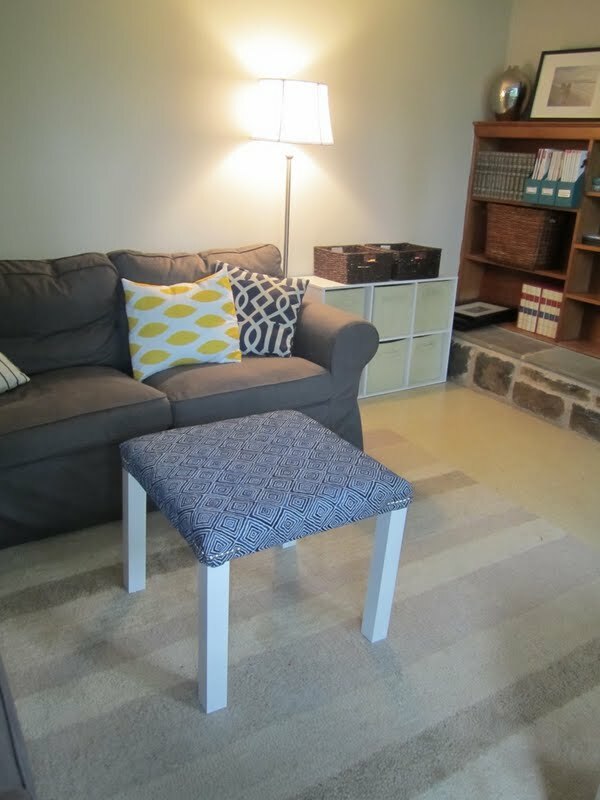 My goal is to minimize the gleaming white tile floor, and this rug highlighted it. Plus, it was just impractical given how much we use this space. I needed something darker and bigger. 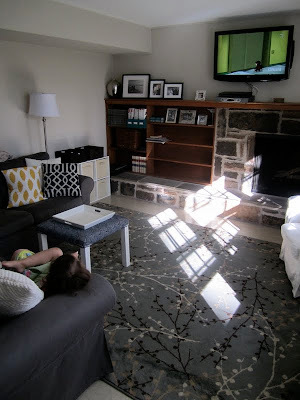 When I painted the living room, I moved the Crate & Barrel rug into the living room and just put the rug that had been in that space in the den. That rug used to be in our first home's living room. It's a great rug, just not the right color for this space. I will use it in our guest room, once I get around to decorating that space. I found my trellis rug through Pinterest of all places! A friend of mine pinned a lovely trellis rug. 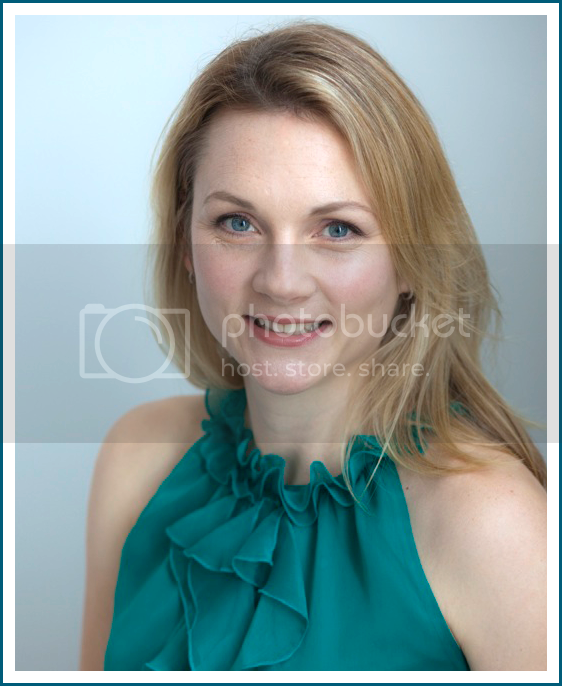 I clicked on it, which took me to Emily A. Clark's blog. It was an older post of hers and she had posted a bunch of lovely rugs. 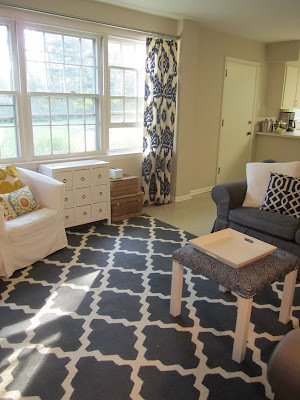 A handful of people asked where the rug was from, and she said she did not know but then offered up some links to other trellis rugs. I clicked and found my rug, the Moroccan Trellis Rug in charcoal, at Rugs USA. I knew I needed an 8x10 size and miracle of miracles, they had it. In the perfect charcoal color. And it gets better: free shipping and 30% off! It is 100% wool too! It's absolutely positively perfect. Here it is again! What do you think? I've already decided that some of my pillows aren't working in this space and will bring in different ones. That's an easy fix. What is not an easy fix? Painting the mantel, built-ins, walls and fireplace. Oh, but I have to do it soon. I cannot wait. Love your rug! I've been hunting for the perfect rug for my place as well but never seem to find one that's right (and that's actually within budget!). Love your choice and those gorgeous sunny yellow cushions too.